What kind of distortion/overdrive pedal does everyone use? I wanted to ask what kind of distortion/overdrive pedal does everyone use? I love my yellow MXR Distortion+ and my MXR Classic Overdrive that I recently bought from Guitar center. I don't have any pedals ATM, always use plug-ins and modeling software these days due to the ease of grabbing great sounding freeware off the net. Have a few small modeling SS amps as well. However in the past I've used lots of stomp boxes. Among my faves, as in had it on my pedal board at some point were these. MJM Blues Devil, the best of the classic 808 clones. Home Brew UFO, Ulitimate Fuzz Octave I swear it sounds more Hendrix than Hendrix did. MI Audio Crunch Box, pretty much is what it advertises to be. Think dial up ZZ Top, Zep, Sab and AC\DC. As fun as those were\are the more subtle boxes, boosts etc, like the Xotic AC-RC-BB stuff, HBE OC44 were my fave. The old yellow MXR rectangular box? I have had a couple. They are all you need. About $60 when I bought, but Im sure they are more now? I use a Digitech RP3 processor. About £150 second-hand 15 years ago. It was quite a serious bit of kit at that time, completely wasted on me and my puny talents unfortunately. I have only ever scratched at the surface of what this baby can probably do. If anyone has or had one of these, can you help, please? I bought a new MXR Distortion+ a year ago for 60 bucks and you are right it seems to be all I need. I get a nice crunchy sound where I can tweak the distortion rate between 70-90 percent. I can get that vintage crunch sound of the 70s that I love. It is like the perfect base if I add any phase, wah, flange or chorus. If I put my EVH phaser on turned slow at about 7 or 8 o'clock with the script button and add some delay from my Danelectro ReelEcho, I can nail the brown sound on the first Van Halen album perfectly with my Epi Ace Frehley Les Paul tuned to E-flat with DiMarzio Superdistortion pickups. If I turn off the echo and phaser and put my EVH wah all the way down, I also nail the Sweet Child of Mine sound to a T.
I guess I am a pedal geek and I just want to see what everyone else is using so I can try other pedals. MXR/Dunlop pedals to me are the greatest! Digitech stuff takes some getting used to. I have a Digitech Brian May pedal that is great but I don't use it that much anymore. It tended to feedback a lot at lower volumes which could be frustrating. But my favorite piece of Digitech gear right now is the HarmonyMan. It takes a little while to get used to it but once you get into it, it is one of my favorite parts of my setup. It basically follows whatever song progression you play and then finds the right key to develop harmonies depending on your settings. I can play the harmony parts to songs like Thin Lizzy's Cowboy Song or The Boys Are Back In Town and Detroit Rock City by KISS. It is around 300 bucks but the harmonies are clean and smooth especially with my MXR distortion on. But I have a friend who I think has an RP3 and he was sort of frustrated with it at times. I have to check with him and see if he has any tips. I no longer use any kind of distortion/overdrive pedal. Mind you, it needed a serious amplifier upgrade to achieve this, in the form of a Blackstar Artisan 30, 30 watt 2x12 combo. It is switchable between 30 watts (pentode) and 10 watts (triode), and on the latter setting sounds superb, with just the right amount of compression/amp sag that I like. I've also upgraded the wiring harness on my Lesters to the 50s configuration, with new volume and tone pots, plus caps. Wonderful. Eventually you realise overdrive pedals just do not cut it, the best advice is to save up for an amp with valves and get your main sound from that. ... the best advice is to save up for an amp with valves and get your main sound from that. Spoken by a true (and wise) believer. Mind you, any old valve amp is not the best solution, and you are never going to get a 100 watt Marshall stack to perform at its best unless you are playing large halls/arenas. There is a growing trend for low-powered valve amps, down to 1 watt output. These amplifiers can be pushed hard at home without you being attacked by the neighbours every time you go out. I've gigged the Blackstar on the 10 watt setting and it was more than enough - unless you have a unfeasibly loud drummer. If you're playing at home or even any gig, you will never need any more than 50watts for a valve amp, 30 is ideal. Most venues mic up amps, thus non making power a problem, but 30 watts will easily help you cut through a band mix. Hell, Jimmy did the entire O2 gig on a 30 watt orange head, mic'd up. But that was in the olden days: after the dinosaurs and before the Falklands war. Modern amplifier designs, especially the so-called "boutique" offerings, are amazing things. Overdrive aplenty, but when you back off the volume control on the guitar they clean up very well. The wiring inside the guitar also plays a significant role in this effect. The key factor is the output of the amp. Far too many players still opt for too much power - 50/100 watts - and will never realise the full potential of their setup because of the size of the venues they are able to play. A good 5/20 watt Class A amp will be able to deliver the goods in most situations. If you need to be louder, stick an SM 57 in front of it. As you say, YMMV and the high-end models are somewhat expensive (try buying a Trainwreck or Dumble amp), but oh..the sound! Good sounds are good sounds. When they were created is irelevant. I find that I like those tones from the "classic rock period" (whatever that means ) more than ever. When I have heard tones that I like recorded more recently, in many cases (more often than not) it's old gear that they're using. Cleaning up from the volume control is a must IMHO, but all the old amps did it, and the best pedals too. When I play "clean" what people are hearing is still going through an OD pedal, just with the volume down on the guitar. True - but that still doesn't contradict my preference for the tones produced by combining good pedals with good amps. ...As you say, YMMV and the high-end models are somewhat expensive (try buying a Trainwreck or Dumble amp), but oh..the sound! I've got no beef against the possibilities that any of these modern amps can offer, but I'm too old to buy into that old line anymore about how all good tone comes from valve amps alone, & pedals kill your sound. That was the point of my original post - I've been there before, believed in the emporer's new clothes, bought the amps... Then one day I realised that it was all crap... Hence the list of guitarists & pedals I posted earier. Well, goodness me - you have the last word on the subject. Last word? Nope, just my thoughts, that's all. It's a discussion isn't it? I wasn't trying to have a "last word" on anything, or upset anyone. It's great! It's the one I use as well and it's killer, preserves tone perfectly with a nice crunch on low settings, I hardly ever crank it but it's great for that as well. 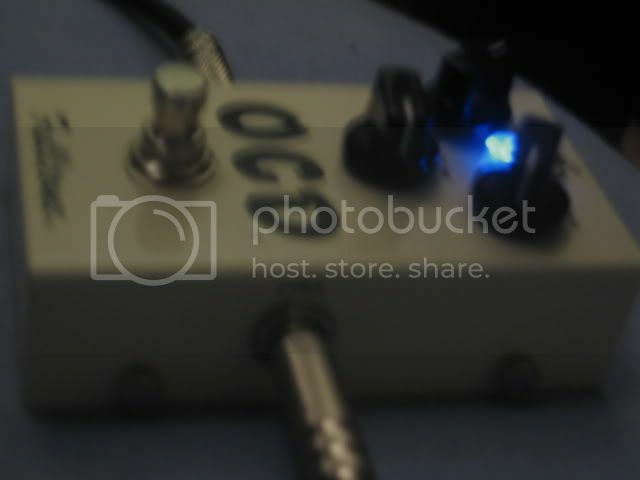 I used to have a Danelectro pedal before that... and well... it went out with trash the day the OCD arrived.. I've got a Marshall Jackhammer box but no amp, so I just play the Epiphone acoustic. I use a Digitech Hot Head. It has good distortion and overdrive. I use Boss MT 2 Metalzone pedal..get nice varied sound from Classic rock to Thrash. what is the best pedal or a classic Jimmy Page '73 tone?